So as part of my Tuesday ritual, I went over to Johnson and Wales University for their weekly food truck round up. This particular round up has been the most consistent and stable of all the round ups throughout the county since the food truck scene exploded within the last 7 months.Today I felt a bit peckish, but wasn't necessarily craving a big fat burger from Jefe's original or a marvelous grilled cheese from Ms. Cheezious. Instead I went for small bites from a few different trucks. First off, I had a pork carnitas taco from Jefe's original, it was too good to take a picture of and I inhaled it seconds after getting it. But trust me when I tell you, it's great. The pork is braised juicy and tender, the salsa verde is refreshing and the tortilla is authentic and fresh. Definitely a must try. 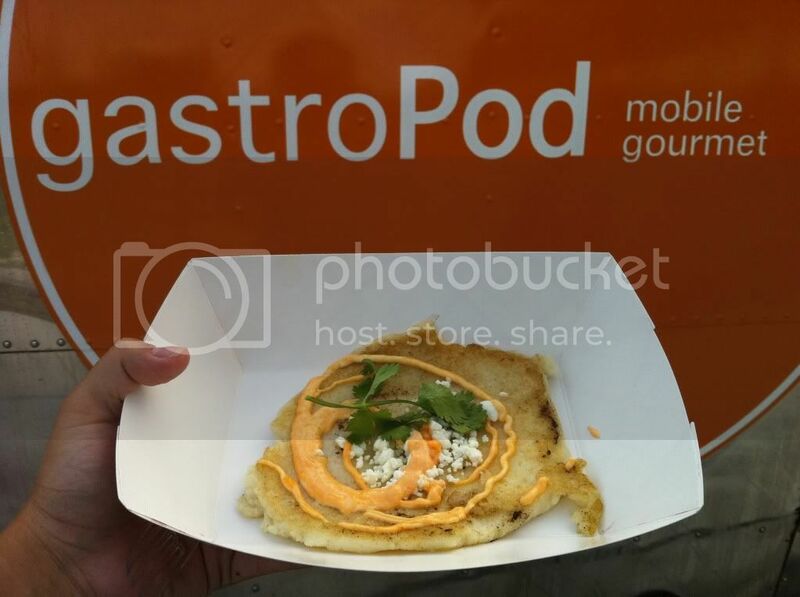 Next up, I walked over to the CheeseMe Mobile for some Macaroni and Cheese Pancakes. This particular truck is on average very overpriced and the quality of their sandwiches is terrible when compared to Ms. Cheezious. Yea I said it. There are only two things they have that Ms Cheezious doesn't, the best tomato bisque soup I've ever had and truffled mac and cheese pancakes. If there is one thing I love more than mac and cheese, it's burnt cheese and this small but amazing dish offers both. Here's a picture of their mac and cheese pancakes before I inhaled them. After that, I decided it was time for something sweet. 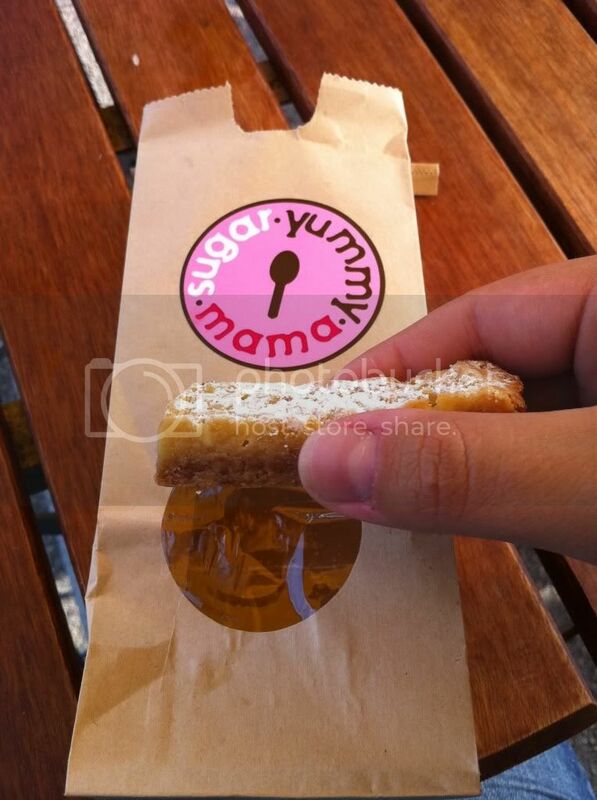 So I paid a visit to Giselle over at Sugar Yummy Mama and I tried her new "Sticky Lips." 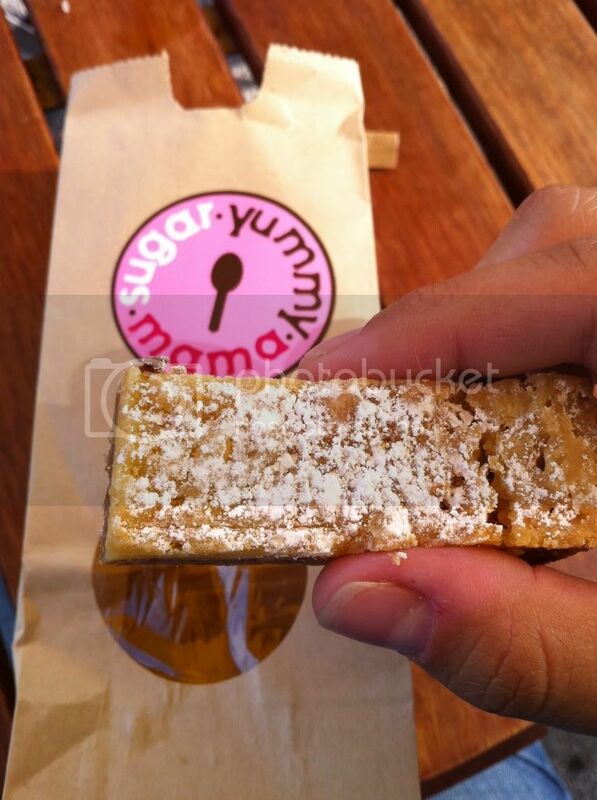 They are oatmeal and caramel bars with the consistency of a lemon bar and dusted with powdered sugar. It wasn't too overly sugary or sweet and it wasn't over powering, which was great. It was different from the regular sweets you see at the food trucks. More importantly, it wasn’t a messy sloppy dessert; which is something you learn to appreciate when eating while walking at these food truck rallies. When I was done with my Sticky Lips, I decided to try something off the new truck in town, Dog Eat Dog. I wasn't sure if I had enough in me to tackle a whole hot dog after so many small plates, so I decided to go with their sweet potato chips with marshmallow sauce. 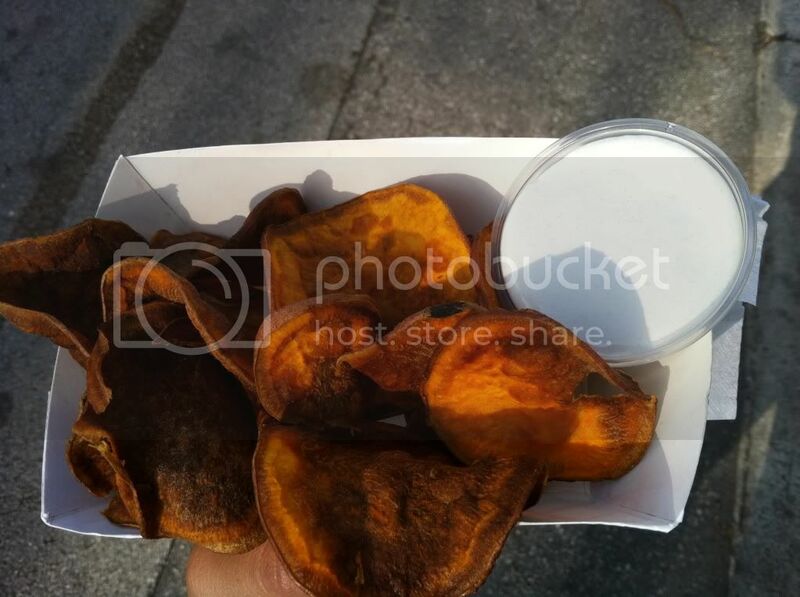 Their chips are made on the truck, but unfortunately they tasted and looked extremely overdone. The chips that didn't taste burnt had the texture of old tires, which was quite the disappointment. Their marshmallow sauce was very tasty, but alas with nothing to dip into it, it was worthless. My last dish of my BTTR adventure was a second chance for the GastroPod. My first experience with them was the greasiest and what felt like the unhealthiest burger I've ever had. They had something on their menu that caught my attention, Colombian style arepas. According to the menu the arepa is topped with Cotija cheese (which has nothing to do with Colombia, it's Mexican cheese) and cole slaw (this and Colombia have nothing to do with each other, period). I decided to try it anyway and ordered it without any cole slaw. They didnt have any arepas ready so I had to wait for them to make the masa and make the arepa. It was nice to know they were making the arepas from scratch and not some ready-made arepa from the frozen food section. What I got was a thick arepa that had a tiny sprinkling of cotija cheese and a swirl of spicy mayo (yet another non Colombian addition). In my 27 years of eating arepas from my Colombian mother, I've never had a greasy arepa... until now. This thing was so greasy, that I couldn't eat it with my hands and had to break out the plastic fork and knife. Once you got past the initial shock of, "How the hell can these people make an arepa greasy!?" It actually wasn't bad. The spicy mayo and cotija cheese worked well with each other and gave it a funky, spicy kick. Although it made me disappointed and puzzled to know that not only are GastroPod's burgers greasy but so is everything else, even the things I didn't know could be greasy. 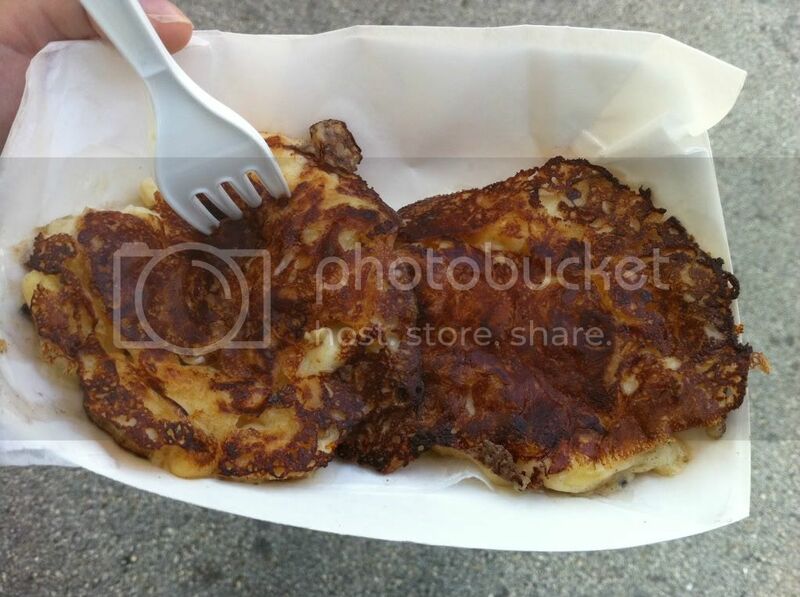 I loved the sticky lips when I tried it at the food truck festival in miami lakes! DELISH! They're really great, that food truck has some funky little ingenious treats. They even do Banana cream push pops.